Whew, HALFWAY! TWENTY WHOLE WEEKS OF PREGNANCY- will be completed on Monda! Such a huge accomplishment. So much has happened these twenty weeks and I guess it’s about time to start sharing where we are with things. 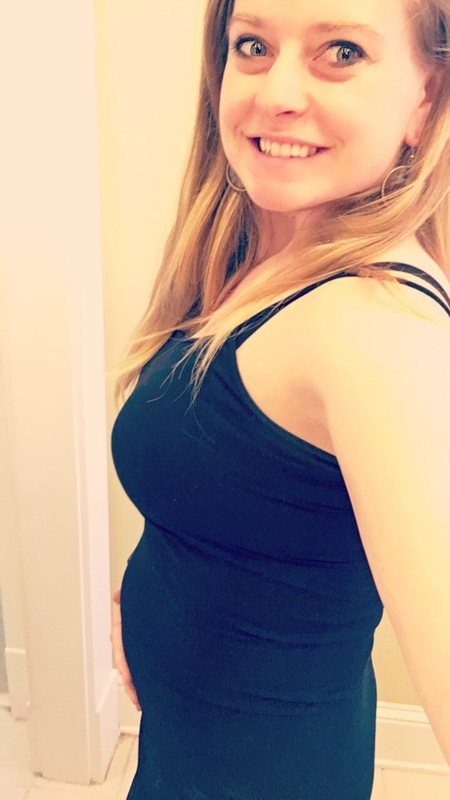 Things are really starting to be “fun!” I say that word because really, pregnancy is an exciting time… and unfortunately I have spent so much of the first half of this pregnancy constantly worrying about things and “hoping for the best, but expecting the worst” to happen. With my first pregnancy, back in 2015, I blogged in a post that I never published about everything happening, and when I look back at that post, I am reminded of how exciting it truly was, before there was ever a fear in my head of what could go wrong. Even with the first scare, I still seemed so oblivious to the chance of complications. It is nice to look back on that and try to remember that first naive feeling. I also kept a blog that has not been published from the first few weeks of this current, third pregnancy. (After my first journaling blog from 2015 that I never published, I didn’t look back at it until later in to this third pregnancy-at times it was too hard to, knowing I inevitably lost that baby.) When I compare the two posts, I realize how much the difficulty of getting pregnant and experiencing miscarriages before having a baby at all, really changes perception. Of course this pregnancy started out with nothing short of obstacles to add to the worry…between bleeding, a hematoma, waiting to pass the week of pregnancy where we lost the first two babies, passing the due date of baby number two, not having bad morning sickness, not gaining weight, rather- losing weight, and not knowing what could have caused previous miscarriages (even though odds are, it was just bad luck, and anyone who has lost a baby knows it is very hard to believe that)… Because we will probably never know what caused those miscarriages, we (I especially) struggled with trying to decide if I should forgo anything caffeinated for a while. Should I exercise? Should I eat chocolate? Is it bad that my resting heart rate is consistently at and around 56? Maybe I should skip any fast food for a while. I will most certainly not be around any form of smoking. I’ll lighten the weight of my work bag. I’ll check my vitamins and nutrients CONSTANTLY to ensure I’m getting enough of everything. LET ME TELL YOU, it takes a lot of fun away from what should be SUCH a fun experience, even if you are sick, tired, feeling huge, etc. I also know that we have so many people rooting for us, and believe me, it helps! Unfortunately, it still doesn’t take away those millions of questions and thoughts, and what ifs. That’s a personal struggle that really only the couple dealing with this truly understands, and it can be so different from another couple’s experience. The best news is, that even though that feeling hasn’t subsided, and probably never will, the farther we get with this pregnancy, the more fun it becomes, because it is finally new territory. I also feel like I appreciate the symptoms I do get, and that honestly- I will be happy to live with any stretch marks, spider veins, or bad hair that I could end up with in this pregnancy, because that’s just part of it- and it means my body was finally capable of doing it. Will is nothing short of an amazing, supportive husband, and even though he too carries a lot of these feelings, he is so good at looking past them and looking at the “now” of it all. To our family and friends who continue to be excited for us, but don’t look past the fact that the unfortunate things have happened- that means the most. It’s part of our journey, you can’t pretend it didn’t happen, so don’t- continue to listen to the hesitation and fearfulness, but also listen to the joy we are having, and keep offering it too. Yes, I have thrown up, a decent amount of times, but nothing that is just killing me! The worst day happened on my way to school, and I literally threw up in the car, while driving! I mean it came out of NO WHERE! (Talk about gross…) Of course, I had no napkins or anything in the car, and Will was meeting me at school to help move furniture around in my classroom. He had no idea what he was about to hear. Needless to say, I walked in, looked at our headmaster and said I was sick and needed to go home. Unfortunately there was a stomach bug going around, so I honestly wasn’t sure which of the two I had… We also had not announced yet. Needless to say, it was not the stomach bug, as I got home to clean myself and my car up- I threw up again, and then even peed a little… Hello, pregnancy, you finally showed yourself- and then I was fine the rest of the day! Chicken was a bit of a turn off for a while, especially if it was marinated and Will was getting ready to cook it. Other than that I have been pretty fine and have felt great for the most part. I have thrown up a good two to three handfuls of times, but fortunately it hasn’t stopped my appetite at all. Oh, poor, poor Will! He has been so disappointed in my lack of cravings! He was expecting to get a wife that was going to want Chinese food, Mexican food, burgers, ice cream, and more. Much to his dis-satisfaction, I never have craved much. At the very beginning I was drinking orange juice like it would never be stocked again, and then I moved on to a glass of chocolate milk each day after school…and even those two cravings didn’t last for long! This 20th week of pregnancy probably marks the biggest week of me “wanting” random things…like french fries, oreos, and Chinese food. I never did cave and get any of those things, so the moment was fleeting- though it did make Will sad! He started his Taylor Made diet again a few weeks back, and the things I wanted are most certainly not allowed, so he couldn’t even take advantage of the moment I finally wanted something! Since 2015 I have been regularly attending Pure Barre classes, and before that, up until December, I tried to run a decent amount- or at least participate in races. Back in October and November of 2016, I participated in a challenge at Pure Barre to complete at least 20 classes in 30 days! (I succeeded, and have the hat I won to prove it!) We found out I was pregnant on December 13- the weekend before that I ran a 10K during part of the St. Jude Marathon weekend-and did really well! As soon as we got that positive pregnancy test though, Will and I decided I would lay off of any exercising until my first appointment later that month- just in case. We weren’t sure if I would be given any different instructions for this pregnancy. My doctor gave me the okay to continue what I had been doing before! While in NC for Christmas, I took a few Pure Barre classes again, as I had been missing it! Will and I then went to Fayetteville, AR for a wedding over New Year’s, and of course, on New Year’s Eve, the bleeding started, while at the reception. Of course there was a major panic attack and Will and I decided I would forgo exercise again until my January appointment. At that appointment we found out I had a hematoma. It (still) is small (and still in me,) but that is what caused the bleeding- the baby had a good heartbeat, so they said to just try not to worry about it too much. Yeah, okay- tell me to not worry about something that can make me bleed…. (since that’s the biggest sign I have had of miscarriages beginning!!!!!!) So, even though the doctor told me it would more than likely be fine to continue what I had been doing, Will and I decided I would still wait until my February appointment before I would do anything else- that would be the official end of my first trimester. Plus, hematomas can actually get bigger, or they can disappear. We were really hoping it would go away, but it hasn’t- it also hasn’t gotten bigger though, which is great! So, I have slowly started incorporating mostly Pure Barre back into my week, as well as some walking/running. So far everything is looking and feeling good! I also love the end of my Pure Barre classes because the move they have us do, always makes me feel like I feel the baby moving! I have tried to use a lot of the modifications during my classes just in case, and am not going nearly as often. Ahhhh, the debate of weight gain! I am most certainly not a picture perfect model of a 5ft, 1in girl with a perfect weight- and that’s okay. I personally am always striving to be healthier, eat a decent diet, and get a good amount of exercise. I am confident in my health as I have regular doctor check ups, and now a dental check up, with absolutely no health concerns at the moment, and not even a cavity! (none for 30 years now, by the way…) I also am confident enough to run races, even if I am not the fastest person. So, according to my doctor, I fall with in the bracket to gain 25-30 pounds over the course of this pregnancy. Because I am pregnant, I am obviously making even more healthier choices than before, and I continue to journal what I eat, and check protein/carbs/vitamins/etc, to make sure I’m getting enough, something I have been doing for a very long time. 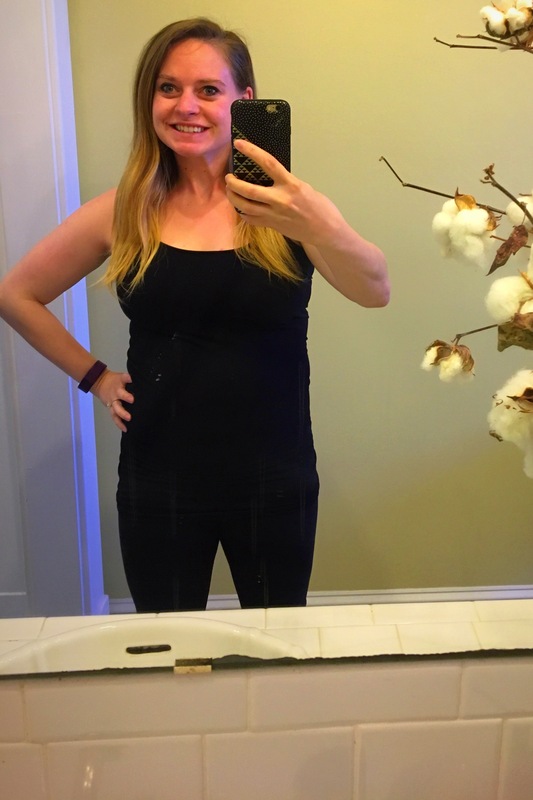 During the first trimester I somehow lost about 6 pounds- which of course worried me, as I was eating a ton of food, not exercising, and really not throwing up or having much food aversion. My doctor told Will and I both that it was completely fine, and nothing to worry about since I was eating well, not sick, and the baby looked good. 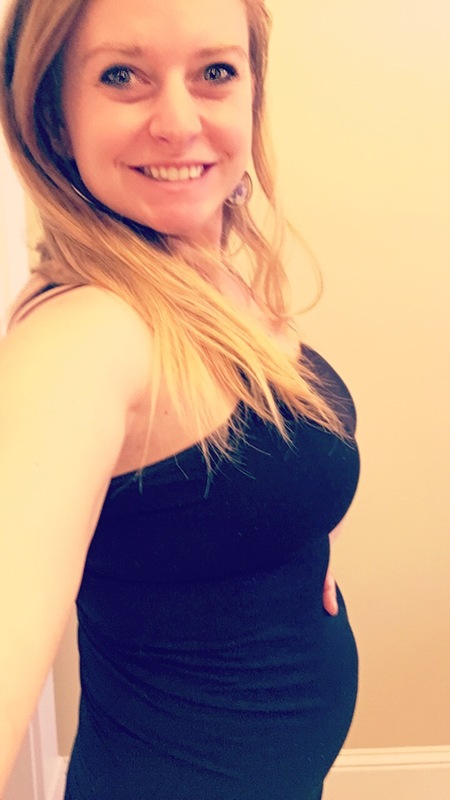 From about that 12th week of pregnancy to now, I have finally put back on about 4-5 of those pounds I lost, and my belly is finally starting to round out some as well, so things still seem good! Like I stated before- Will and I do tend to eat fairly healthy diet and try to eat at home as much as possible too. I usually have my vitamins in the morning with water and some type of cereal (Cheerios, Kix, or some type of granola cereal.) I take fruit, Luna Bars, and Carnation High Protein Shakes for snacks, eat some type of sandwich for lunch, eat a boiled egg, have yogurt, and some type of vegetable, rice or potato, and chicken, fish or ground beef or turkey for dinner. Before pregnancy I never did drink many sodas- I pretty much drink water all day, every day. I did have a good cup of coffee every morning before getting pregnant, but have cut that out with this pregnancy, jusssssst in case the caffeine had anything to do with previous miscarriages. (Like I said- if you’re anything like me, you question EVERY possible thing that could have caused a miscarriage…) I keep debating if I’m ready to have a cup again, but also figure I’ve made it this far that I can probably last a little longer! I do enjoy my own version of a sundae from Sonic, and trust me on this, it is worth trying it you don’t have ice cream shops near you- I order a Hot Fudge Sundae (with whip cream and a cherry on it) and have them add warm peanut butter and crushed peanut butter cups! It seriously is so good, and our Sonic makes some of the smoothest vanilla ice cream- it’s Heaven! I do limit myself on having them occasionally though-especially since Will can’t really celebrate and have one with me! Will says I’m moodier…. and I probably am! I can be such an emotional person to begin with, that he probably does notice it amplified some, buttttt, well- it comes with the territory! (Supposedly more so if you’re having a girl-based on Old Wive’s Tales!) My energy level has been pretty decent, though I have gone to bed much earlier this whole pregnancy than my non- pregnant self. During this 20th week of pregnancy the moodiness and lack of energy have officially hit where even I notice it. I am in the midst of figuring out how to sell my house in NC and what will need to be fixed in it, as well as changing insurance, and so on- so I am sure that has added a lot to the mix! Friday morning for instance, was probably a far exaggeration of my fear of spiders with super amplified emotions thrown in! I was packing my lunch, and trying to figure out what to eat (Wells ate my box of cereal the night before…..) and I was tired…and had burned dinner the night before…. Well, I look down and on my leg, on my SKIN was a SPIDER. I HAAAAAAATE spiders…a lot! Of course I lose it like I usually do and decide I need to scream and yell…and cry! My dog, Toby thinks he needs to rescue me, so he’s barking and jumps up on my legs, so now I have a scratch and bruise line bigger than my hand on both thighs, and Will thinks I have seen a mouse or snake or something much worse. He runs in, and I tell him it was a spider, and he (tried not to) laughs at me, and just hugs me. I still cry for a minute and then get myself together. Needless to say, my fear of spiders and seeing one on me does not go well together with my emotional, pregnant self, this 20th week of pregnancy. The emotions have arrived! Yes, yes, yes, I think so! I’ve felt some kind of feeling since about 14ish weeks, but was never really sure if that is what is really was or not. However, the feeling still pops up now and again, and Will and I both thing that if we keep our hand on my belly for a little while at night, we have felt her! It’s quick, and NOT hard at all, and so easy to miss, but so fun! So, I guess that concludes this incredibly long, updated post of everything going on in our pregnant lives. I have had a couple people ask for pictures, and I must say, our little baby girl is finally making her appearance! I guess those pounds I have gained back have gone straight to my belly! Will looks and will just bust out laughing in the sweetest way! The kids as school are constantly asking me when I get to see the baby, how I get my shirt on with the baby there, and why does she hide for so long…. The K4 teacher, Amy Reyna also busted out laughing Friday when I walked in her room, noticing how big my belly suddenly was. Seriously- she popped up out of no where- but I guess it’s about time! =) Also, I’m not much of a “selfie” person, by myself…so this was a little awkward to take these pictures! I also just got back from Pure Barre, so I did change the color some, so I wouldn’t look quite so red/sweaty/yucky! As for this baby girl’s room- I seriously can’t wait to do more…. and I am having far to much fun looking at nursery ideas and buying clothes, bows, and decorative stuff- so I put a halt on all of that for a little while! We have our next appointment this coming Friday, so I figure we’ll also get another confirmation that this baby is still actually a girl, or find out if we’ve been fooled, and it ends up being a boy! hahaha, I’m pretty confident the first ultrasound is still right, but you never know when you find out early! So we did buy a dresser and end tables for the room, and actually got them on ETSY! The furniture is very durable, and was painted very well! The dresser is larger, like we wanted, as we are skipping a changing table, so we could save that money, and add a little more to the price of the dresser. I tend to really like french, antique- styles, and this clearly fits right in! I also ordered the prettiest little hair band and hair bow holders, because let’s face it, I think they are adorable on little babies! This part truly is making everything so real, and so fun, which helps side track from any of the worrisome feelings we get! Next up, to decide on a name…..